Vanessa and Robbie planned an elegant Galt Museum ceremony and wedding reception on the cusp of autumn. With glimmering rose gold and soft pink accents and well tailored suits, their wedding party looked so sharp! They started their day with a first look at Nikka Yuko Japanese Garden and had their family join them there for photos. After their romantic and joyfully emotional ceremony at the Galt, we headed to the University of Lethbridge, which is where their journey together began. The couple placed so much importance on family, including all of their siblings in the wedding party and making sure everyone close to them felt as important as they are. They were so ecstatically happy all day! Even as the pre-dinner sleepiness started to set in, they were still elated to be in each other’s presence and couldn’t stop grinning. Julia and Kyle have a love at first sight story and continue to look at each other with that intensity. Both of them were so emotional at the ceremony, quickly shifting from happy tears to giant smiles. 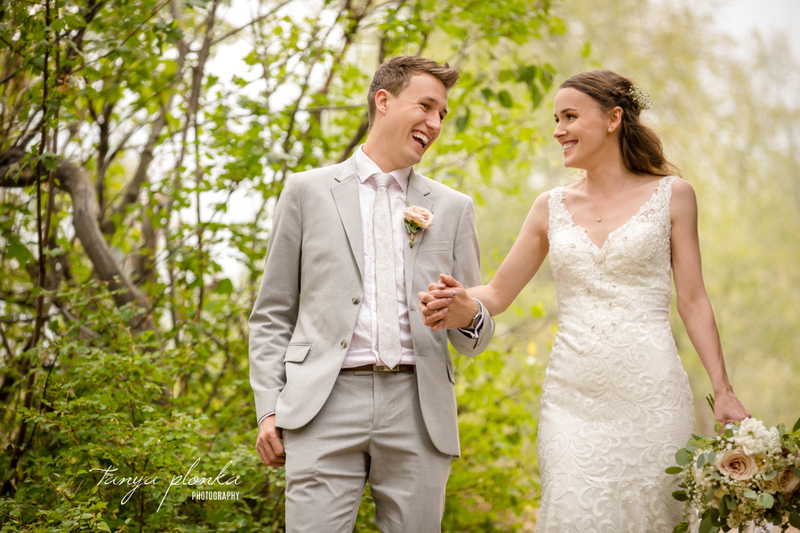 Their wedding party kept them laughing all day and made the best use of their half day in Waterton by exploring the landscape. From going barefoot in the water to using downed trees as balance beams, they made use of all the nature around them! Kyle and Julia have such special relationships with their family that their siblings are also considered friends to each of them and were an obvious choice to have in their party. Once we completed photos in Waterton, we drove out to Cardston for their tent reception at Kyle’s dad’s ranch where they were free to party all night. Their nieces and nephews were (mostly) excited to have a photographer come visit and gave us all kinds of adorable poses! We had quite a few family members tasked with removing photobombing children from photos, and later the dogs and barn kittens started crashing the shoot too! The Picture Butte Golf Club was very generous with letting us run around the course for photos and explore the grounds with a whole fleet of golf carts. Makayla and Cornell have such a great group of people they call friends. Like the other weddings, we spent the day in laughter and never knew what silliness to expect when we turned around. They have such great senses of humour and will have an amazing lifetime together making each other laugh. Kathleen and Mike planned a gorgeous Historic Norland Estate summer wedding over the August long weekend. 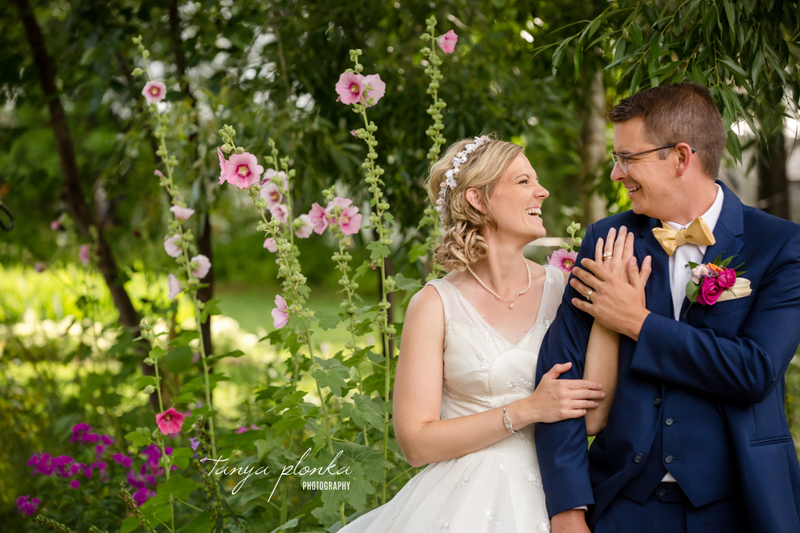 Their wedding embodied summer with bright colours and lemonade! When Kathleen enlisted her sister for help planning the wedding, any indecisiveness eventually led to her sister Googling “grandma wedding” for the perfect inspiration. Kathleen did all of the cross-stitching that was on display at the wedding. This included table cloths, table numbers, artwork, special charms for each bridesmaid, and even a rocking chair! Family members helped out with other details, including their beloved lemonade stand which was created by Kathleen’s brother in law. Family played a very important role in their wedding day. Both of their mothers witnessed the marriage certificate, and their daughter had the most important role as maid of honour. On the way to the Norland, Kathleen and her sisters made a detour to the cemetery to visit their father. They kept their eyes mostly dry by bringing a dance party to dad as they delivered his boutonnière! Between all the silly faces, the constant dance parties that would break out, and Kathleen and Mike’s amazing love for each other, we had such a fun day with them and their friends and family. 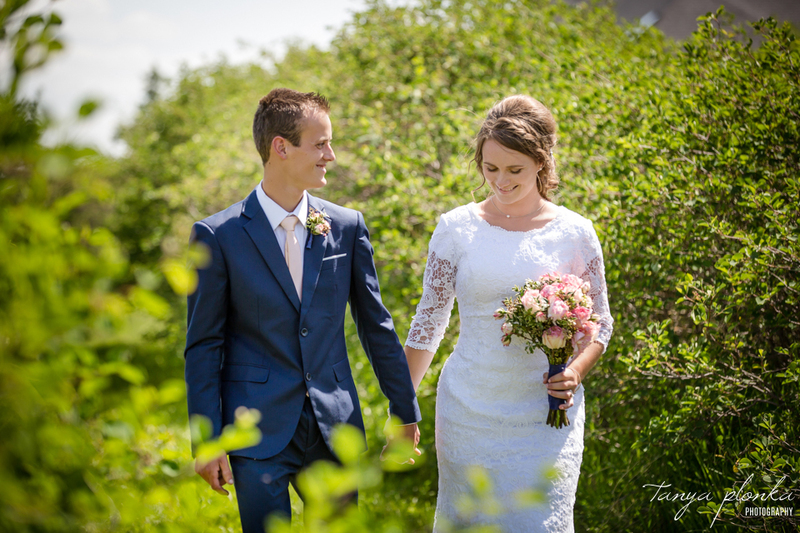 Kate and John chose a beautiful mid-spring day to have their wedding at the Fort Macleod NRC Church. All day they were full of smiles, joking with their friends but mostly flashing huge grins whenever they caught each other’s eyes. 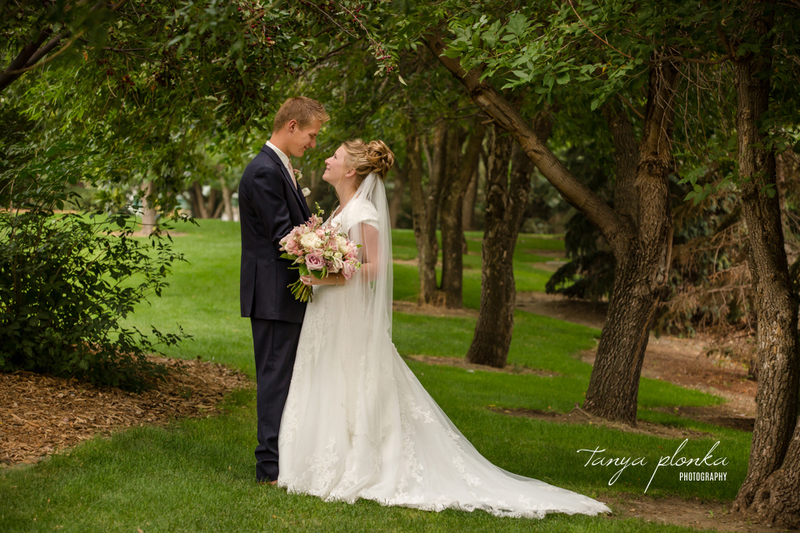 They picked so many perfect details to accent their romantic Fort Macleod wedding photography. Soft pinks, navy blue, well-tailored suits, a classic rose bouquet, and gorgeous lace detail on Kate’s wedding dress all tied the romantic theme together. Their wedding party was made up of a variety of family members who double as close friends. Each member was very well selected, constantly going above and beyond to help the married couple by doing things like fixing Kate’s hair, checking in with property owners, and picking up pizza. Normally I choose most photo locations for my couples, but Kate did all of her own scouting and found some amazing spots! We got to go inside an old wooden grain elevator and visited a few older style houses within Fort Macleod, all with beautiful front porches. Kate has an amazing eye for historic design. Each time we switched locations, I was excited to see what we were going to find! 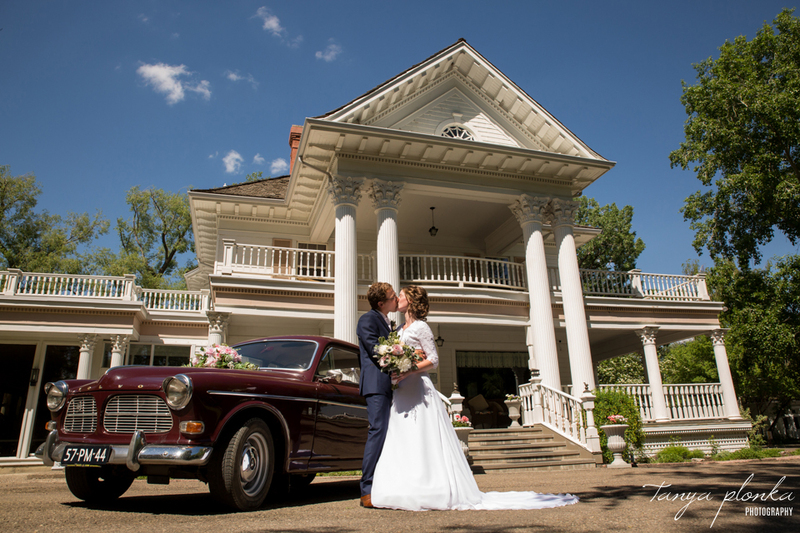 Robyn and Wayne chose a beautiful, warm spring day to have their wedding. After they were married at the Lethbridge NRC Church, they and their familes joined us for Norland Estate wedding portraits. The property was so lush with all the fresh spring growth. We finished off their portraits at Henderson Lake to make use of the gorgeous lilac bushes. They included so many classic and romantic elements in their wedding day. Robyn’s dress had beautiful lace sleeves and details, and her bouquet featured soft pastel colours. Wayne wore a well tailored navy suit with black trim and they brought along a family member’s burgandy vintage Volvo car as their wedding day ride. The Norland and this car went so well together!